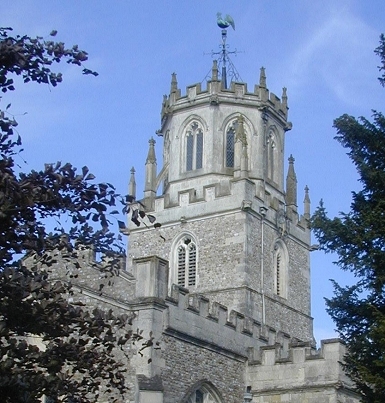 Colyton Parish is situated in the south east corner of the district close to the border with neighbouring Dorset. The council authority was formed in 1894 and is one of the largest in the East Devon District. Population has changed little over the years having been 2,451 in 1841 and 3,165 at the last census in 2011. White's Devonshire Directory of 1850 described the parish as comprising about 8,000 acres of fertile land, including the hamlets of Purlbridge and Colyford, and many scattered houses. One ancient farmhouse known as Yardbury was for some generations a seat of the Drakes. Much of the parish is designated as an Area of Outstanding Natural Beauty or an Area of Great Landscape Value. The River Coly has its source above Farway being joined by the Umborne Brook at Colyton from where it flows to join the Axe at Colyford at the south end of the parish. The centres of population are Colyton, and Colyford, both centres have designated Conservation Areas. The two settlements in the parish are quite distinct both in terms of size and history. Today, agriculture remains the main occupation outside the two settlements together with tourism. Over the centuries tradesmen had improved and maintained a wide range of skills ensuring the town was fully independent. For example the records of 1838 show a remarkable list in the town: market traders, farmers, millers, butchers, bakers, shoemakers, coopers, curriers, druggist, a fishing rod maker, glove maker, tanner, gunsmith, linen drapers, foundry, maltsters, brewers, innkeepers, milliners, saddlers and harness makers, rope and twine maker, stone masons, surgeons, barbers, tin plate worker, watchmaker and wheelright. Whites Devonshire Directory of 1850 showed markets being held on Thursday and Saturday but, by then, said to be 'of trivial consequence'. Cattle fairs took place in May and October. The listing also included 'The Church' (St. Andrew) which is a fine ancient structure, in the perpendicular style, 120 feet long, with a 95 feet high tower in the centre containing a musical peal of six bells, and a good clock. In the chancel are several handsome monuments to the Pole and other families. From the Feoffees income a sum of £30 a year was paid to the master of the Free School, for instructing 20 boys in reading, writing and arithmetic. The master has also the free use of a house and school-room which was built in 1612. TODAY there remains a narrow and fascinating street pattern together with a wealth of old and listed buildings. The last remaining oak bark tannery in the country thrives, despite modern competition, to produce some of the finest finished leather hides. The town takes pride in its traditional wheelwright who has gained a Royal Warrant and works "By Appointment to Her Majesty The Queen". A wide and interesting range of challenges from carriage to cannon keeps the workshop fully employed. SELF GUIDED TOUR: Some years ago the local primary school, working with the history society, produced a self-guided walking tour of Colyton. This listed some thirty five notable points around the town and illustrates the amount of local history and interest that Colyton offers. The oldest historic building is the Church of St Andrew with its much admired lantern tower dating back to the 15century. Inside is a tall, colourful and most impressive west window particularly stunning when the sun comes around. 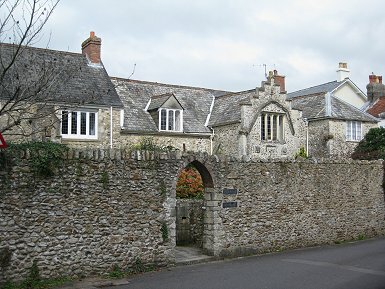 The nearby vicarage dates from 1525, whilst Church House in the Market Place goes back to about 1600. The Merchant's House is of similar antiquity but modern rendered elevations deny its age. 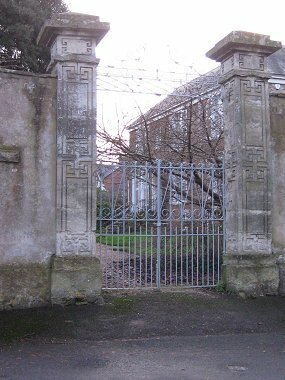 Georgian style Colyton House with its mysterious high walls was built about 1750, and Great House is a fine example of an Elizabethan building. 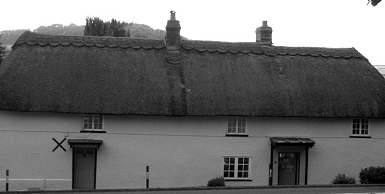 Several thatched cottages remain, dating from the 15th century. A visit to Colyton will of course reveal much more. History tells us Colyton experienced periods of importance, prosperity, suffering, drama and notoriety….….. today you may be assured of peace and tranquility. LOOKING BACK there has been a settlement at Colyton since before Saxon times. The suffixes ' Hayne' or 'Haye are widely used for property in the parish, being Saxon denoting boundary or enclosure. When the Romans left, the arrival of Anglo and Hiberno Saxons brought about major social and economic changes. Colyton became a 'ton-ship' with local political and legal importance. In 827AD a Saxon Parliament (the Witenagamot) was held here. It is those early origins that are responsible for the circular street pattern often referred to as a maze. A fine Saxon Cross in the Church of St. Andrew in Colyton is believed to date from before AD900 having been discovered embedded in a wall during repair work after the great fire of 1933. THE NORMAN CONQUEST brought social and land ownership changes which would have a lasting effect and began the connection with nobles from France establishing themselves here. The Domesday Book of 1086 included Colyton as part of the West Saxon Royal Demesne. 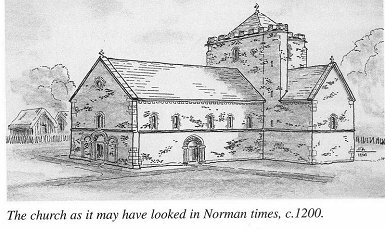 Colyton's church was remodelled and extended by the Normans during the period 1090 to 1200. 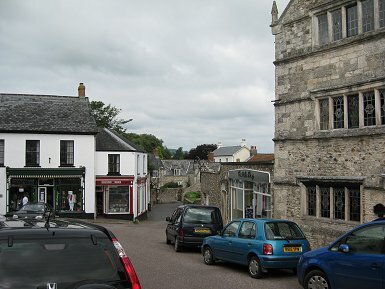 IN THE MIDDLE AGES the wool trade had made Colyton a great Devon town. During the 14century, Colyton was listed as the 4th richest town in Devon according to taxes paid by its merchants. The construction of the fine and rare octagonal lantern on top of the church tower indicates the wealth of Colyton during this period, far exceeding what would be expected of such a small community. By the end of the 16th century wool was only a small part of the economy. 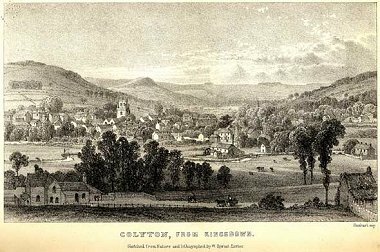 From the early 16th to the early 19th centuries Colyton was essentially a self-contained agricultural parish with its own mills, iron foundry, wheelwrights, etc. Lace making was carried out in many homes. In 1645/6 once again it was visited by the plague when the Parish Register records a total of 458 deaths - a substantial proportion of the population. IN 1538 there was a most significant and dramatic event which would lead to a settled and progressive life in Colyton. For many years the Colyton lands had been in the possession of the Courtenay family. The then Lord of the Manor, Henry Courtenay, Marquis of Exeter fell foul of his cousin Henry VIII. 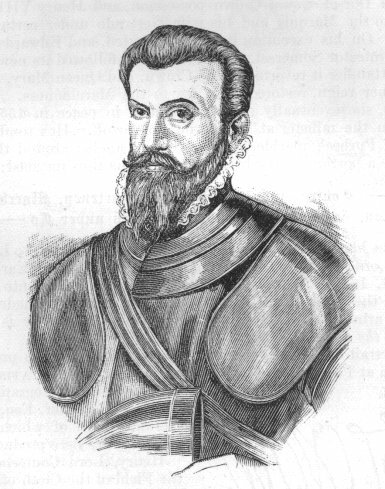 He was executed and all his lands confiscated to the crown. A while later, shrewdly judging the moment when the King was in need of money for his wars and shipbuilding, a group of farmers and merchants got together the sum of 1000 marks. With this they travelled to London and managed to negotiate the purchase of much of the seized estates from the King. This resulted in a deed of "feoffment" being signed on 6th January 1546. COLYTON CHAMBER OF FEOFFEES became the body charged with using the proceeds for "good, godly and commendable purposes". Included was the management of local fairs and markets at which a Court of Pie Powder could be held – a system for administering on-the-spot justice. In 1547 the Chamber appointed a Bailiff to administer its affairs and keep meticulous records of meetings and accounts. These continuous records remain in existence providing a record of over 450 years history in the parish for which translation is awaited. Subsequently it is the Feoffees who have been responsible for many public initiatives and the forerunner of what we know as local government. 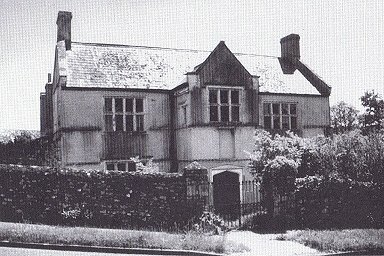 The first development of note was the founding of Colyton Grammar School in 1546. An early water supply was introduced in 1641 when they arranged for "spring water to be channeled into a leat (ditch), cut through meadows and collected in a large underground tank" which is still in existence. 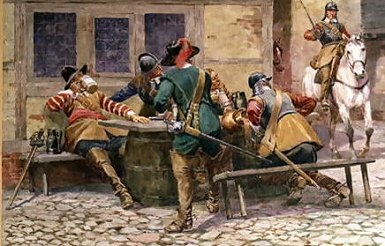 They were also instrumental in creating a local fire brigade in 1641. Street lighting was introduced in 1858, again at the Feoffees" instigation. Drinking water supply became available in 1880 and maintained until 1964 when it was taken over by East Devon Water Board. A new Town Hall was built in 1927. Formerly, grants were made to the needy of the Parish for the purchase of food, fuel and blankets. In modern times support of academic and sporting pursuits by young people has been encouraged and they work closely with the Parish Council. DURING THE CIVIL WAR the town appears not to have taken sides but nonetheless found itself on a route between opposing forces. There were many skirmishes in the streets and disruption to its population as burial records demonstrate. Colcombe Castle, garrisoned for the King was much destroyed in a reprisal raid by Parliamentary troops. 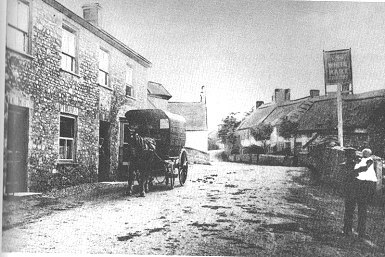 A little later Colyton gained a dramatic entry in historical records as being &quot;the most rebellious town in Devon". In 1685 Non-conformists and dissidents supported the Duke of Monmouth in his ill-fated campaign to take the English crown from his uncle James II. 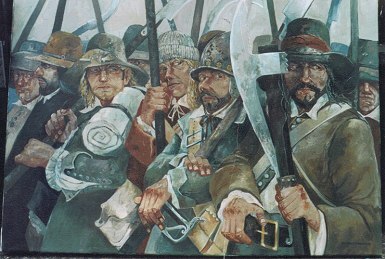 Over 100 Colyton men joined the Duke"s army when he landed at Lyme Regis but in the aftermath many were hanged and others transported into slavery in the West Indies. The tramway uses the old railway track that was once the branch line (laid in 1868) to Seaton from Axminster via Colyton and closed under "Beechings Axe" in 1967. Apparently Colyford gained its name from an ancient ford on the River Coly which today passes under the old bridge to join the River Axe. This road was part of the main Roman route to Exeter and a branch of the Icknield Way. As an important route and river crossing point an inn or hostelry of some kind has doubtless existed here for many centuries. Opposite the inn is Chantry Field where once stood St Edmunds Chapel used by travellers passing through and noted in records of at least 1547. THE EARLIEST OCCUPATION after Iron Age man is thought to be by the Phoenicians who first used the estuary establishing a trading post somewhere between Seaton and olyford. Later, the Romans occupied the area early during their conquest of Britain and established a port at Seaton (supposed to be the roman town of Moridunum). The estuary was an important harbour in ancient times becoming known as Culliton Haven. After the Romans and Saxons, it was used by the Danes. THE SAXON PERIOD places Colyford within the Hundred of Colyton and was part of a royal estate. 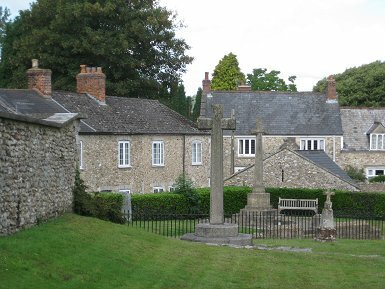 The Manor of Colyford was granted to a succession of Barons after the Norman Conquest. In 1199 it came into the possession of Thomas Bassett by Richard I. Subsequently a Royal Charter was obtained which constituted Colyford as a Borough. King John granted rights of a Michaelmas Fayre to Thomas Bassett in 1207. It flourished for a hundred years or so as a medieval town, mainly associated with the sea because the estuary was deep enough for ships and boats to reach the dock at Colyford. In about 1500 a decline set in, due to a large shingle bank being thrown up at Seaton which caused the estuary to silt up. 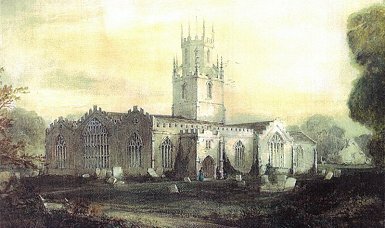 As with so many communities it was decimated by the plague, after which it became a tithing of the parish of Colyton. MOVING ON, Colyford in later years was a Rotten Borough and therefore had a right to be represented in Parliament. These were boroughs in which parliamentary elections were determined by bribery and corruption, in which nomination of candidates lay in the hands of one or few individuals. The 1832 Reform Act defranchised 'rotten' boroughs restoring the meaning of borough to its previous significance. THE ANCIENT BOROUGH still exists, although no part of local government structure, and at its annual meeting elects a mayor, clerk and constable. Famous for its Goose Fair which retains all the flavour of medieval fayres and always takes place as dictated by tradition on Michaelmas Day, the last Saturday in September. Today Colyford is now mainly residential with a population around seven hundred and home to Colyton Grammar School taking great pride in its academic achievements. 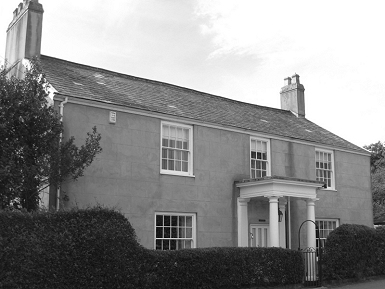 The school was originally created by the Chamber of Feoffees in Colyton in 1546 and moved to its current site during the 1920s. 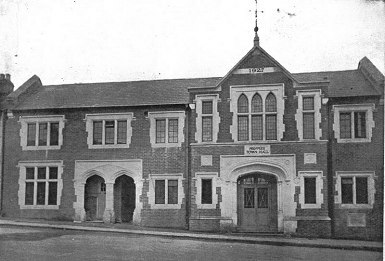 The school was originally housed in the building shown left which later became a post office and is now a private dwelling named Church House. An excellent book "Colyford Ancient Borough and Royal manor" written by Roy Chapple was published in 2005 and provides a comprehensive history. It is out of print but available in local libraries. A STROLL UP THROUGH THE VILLAGE along what is now Swan Hill Road reveals many points of interest and attractive properties, some still thatched. 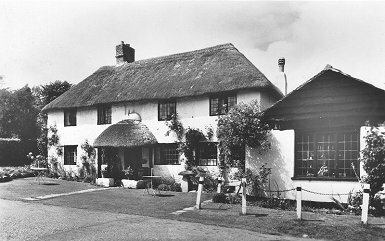 Ship House is opposite Pear Tree Corner, once an inn and farm. 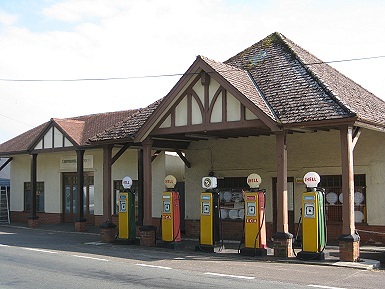 A few doors along is the old filling station with original pumps which operated for much of the last century having been built around 1928. Painstakingly restored and maintained; their attendant service existed until it finally closed for fuel in 2001. Across the road the old wheelwright's house and workshop 19 became the inn of that name in the 1970s having been a tea room for many previous years. Behind was a Weslyan chapel built in 1833 with a later school room added at the rear and converted to a home in the 1980s. 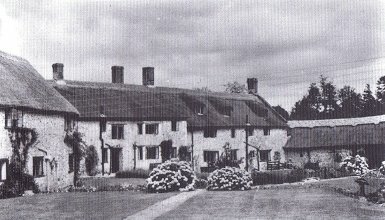 In the now developed surrounding grounds is 16th century Stowford Manor House which became a farm until the 1920s when it returned to a private residence, later a hotel and finally divided into three homes. 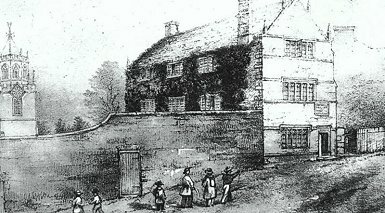 Opposite Yeomans Acre Hotel was Mount Pleasant Farm and one of over twelve farms in the borough. Adjacent to the post office and butchers the house named Hillside was once the Swan Inn. By church standards St. Michael's & All Angels Church is relatively new, having been completed in 1889. The inside reflects the architecture of the mid to late nineteenth century. At the western end of the village is Stafford Barton an impressive Tudor house once the dower house to the manor. A walk around Colyford's lanes reveals much more, and from opposite the White Hart a pleasant riverside walk connects with Colyton.